BURBANK, Calif. (April 8, 2013) – Following in the footsteps of the record-breaking Marvel Studios’ release, “Marvel’s The Avengers,” production on the highly anticipated release, Marvel’s “Captain America: The Winter Soldier” has commenced in Los Angeles, Calif., with production also including locations in Cleveland, Ohio, and Washington D.C. Directing the film is the team of Anthony and Joe Russo (“Welcome to Collinwood”) from a screenplay written by Christopher Markus (“CaptainAmerica: The First Avenger”) & Stephen McFeely (“Captain America: The First Avenger”). Marvel’s “Captain America: The Winter Soldier” returns Chris Evans (“Captain America: The First Avenger,” “Marvel’s The Avengers”) as the iconic Super Hero character Steve Rogers/Captain America, along with Scarlett Johansson (“Marvel’s The Avengers,” “Iron Man 2”) as Black Widow and Samuel L. Jackson (“Marvel’s The Avengers,” “Iron Man 2”) as Nick Fury. In addition, film icon Robert Redford has joined the all-star cast as Agent Alexander Pierce, a senior leader within the S.H.I.E.L.D. organization. “Captain America: The Winter Soldier” is set for release in the U.S. on April 4, 2014. In the summer of 2011, Marvel successfully launched two new franchises with “Thor,” starring Chris Hemsworth, and “CaptainAmerica: The First Avenger,” starring Chris Evans. Both films opened #1 at the box office and have grossed over $800 million worldwide combined. In 2010 “Iron Man 2,” starring Robert Downey Jr., Gwyneth Paltrow, Don Cheadle, Scarlett Johansson, Sam Rockwell, Mickey Rourke and Samuel L. Jackson as Nick Fury took the #1 spot in its first weekend with a domestic box office gross of $128.1 million. Marvel Entertainment, LLC, a wholly owned subsidiary of The Walt Disney Company, is one of the world's most prominent character-based entertainment companies, built on a proven library of over 8,000 characters featured in a variety of media over seventy years. Marvel utilizes its character franchises in entertainment, licensing and publishing. For more information visitmarvel.com. Should be a good one to give a run. I have to hurry up and see the first one. ;) We did see Avengers and that's where my son decided Captain America is a boss. I haven't either, but I've seen The Avengers and really liked him in that... my sister-in-law is in love w/the guy who plays Thor. 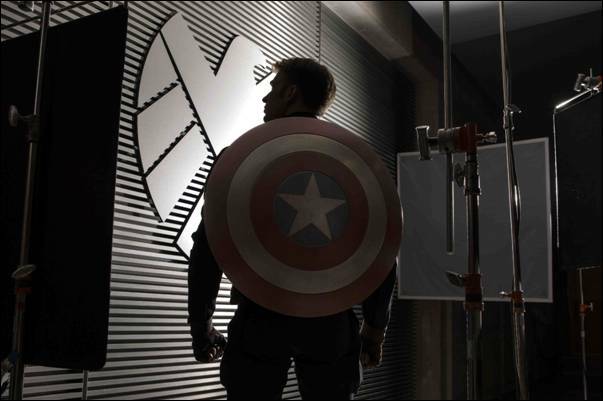 I haven't seen this one yet, but I got a small taste of Captain America when we watched The Avengers. He looks like quite an interesting character! This is one I haven't seen either. My Hubs would most likely like it. Speaking about bread. I prefer hard dough bread like they do in my country and I'm thinking I should start making my own. Ohh, that sounds temptingly delicious! Oh yeah, my son does too. when are they going to come out with the sequel? smiles.